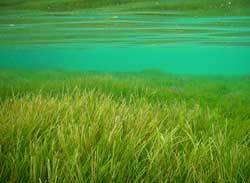 Seagrasses are flowering plants which grow in near shore brackish or marine environments. 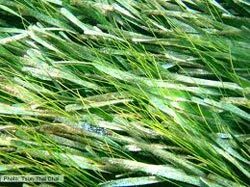 They are called seagrasses because the leaves are long and narrow and are very often green, and because the plants often grow in large "meadows" which look like grassland. There are currently 58 known species known of which Australia is home to 30 or more than half. They are found in temperate and tropical regions of the world. They are closely related to terrestrial lillies and gingers and evolved from land plants and adapted to marine life around 100 million years ago. Seagrasses have roots (rhizomes), shoots and leaves. The specialised roots (rhizomes) creep along the bottom, and produce upright shoots. The rhizomes and roots anchor the plant to the soft bottom and absorb nutrients. The leaves are generally long and strap shaped but may be paddle-shaped. is bringing seagrass back to life.